How to prevent anonymous answers for my survey? I have a quick question about the survey module: students are emailing me saying that when they get the results, they can’t see whose response it was. It sounds like they must ask for name and email. Is there any way to find out whose response it is without having to create a question for it? You can manage the settings of your survey by cliking on the 'Settings' button. 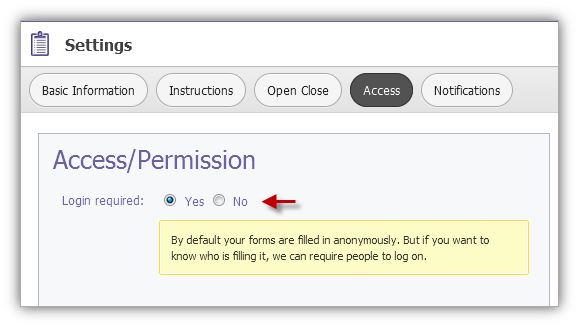 Then, click on the 'Access' tab and select 'Yes' for the 'Login required' field. Finally, hit 'Save' at the bottom of the page.